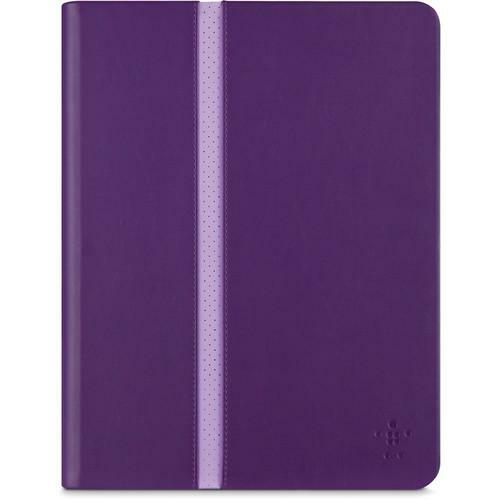 We recommend checking out our discussion threads on the Belkin Stripe Cover for iPad Air 2 and iPad Air F7N252B1C02, which address similar problems with connecting and setting up Portfolio Cases Belkin. The user manual for the Belkin Stripe Cover for iPad Air 2 and iPad Air F7N252B1C02 provides necessary instructions for the proper use of the product Computers & Solutions - Tablet & Computer Cases - Portfolio Cases. 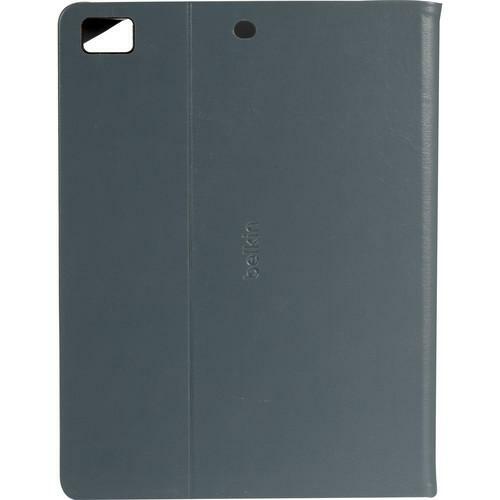 The dark gray Stripe Cover for iPad Air 2 and iPad Air from Belkin protects an iPad Air or iPad Air 2 within its slim, lightweight, and stylish pinstriped design. An internal frame with flexible silicone corners gently locks your iPad Air into place while offering protection from bumps and impacts. When you wish to view your iPad's screen in landscape mode, the internal frame can be tilted up and held in position by the cover which converts into a stand. Rubberized feet on the frame that rest against the cover's inner texture, plus a hinge stop allows for flexible angle selection and keeps your tablet steady while in the viewing position as you touch, swipe, or type. When typing for long periods of time, the Stripe Cover for iPad Air 2 and iPad Air can be set to a lower, more ergonomic typing angle in order to reduce stress on your wrists. Box Dimensions (LxWxH) 10.8 x 7.6 x 0.8"
The user manual for the Belkin Stripe Cover for iPad Air 2 and iPad Air F7N252B1C02 can be downloaded in .pdf format if it did not come with your new portfolio cases, although the seller is required to supply one. It is also quite common that customers throw out the user manual with the box, or put the CD away somewhere and then can’t find it. That’s why we and other Belkin users keep a unique electronic library for Belkin portfolio casess, where you can use our link to download the user manual for the Belkin Stripe Cover for iPad Air 2 and iPad Air F7N252B1C02. The user manual lists all of the functions of the Belkin Stripe Cover for iPad Air 2 and iPad Air F7N252B1C02, all the basic and advanced features and tells you how to use the portfolio cases. The manual also provides troubleshooting for common problems. Even greater detail is provided by the service manual, which is not typically shipped with the product, but which can often be downloaded from Belkin service. If you want to help expand our database, you can upload a link to this website to download a user manual or service manual, ideally in .pdf format. These pages are created by you – users of the Belkin Stripe Cover for iPad Air 2 and iPad Air F7N252B1C02. User manuals are also available on the Belkin website under Computers & Solutions - Tablet & Computer Cases - Portfolio Cases.